We had the honor of seeing Miss Sheri's parents not once but twice this week!! The excitement level was electric. 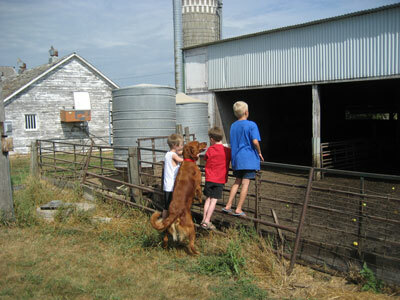 Trips to the farm are always quite fun. I don't know if the pigs remembered me or not, but when I stuck my head in the barn they all suddenly looked at me with a hint of familiarity. Then I yelled Boo and they all ran away as fast as they could nearly trampling one another in the process. I'm pretty sure they remembered me. 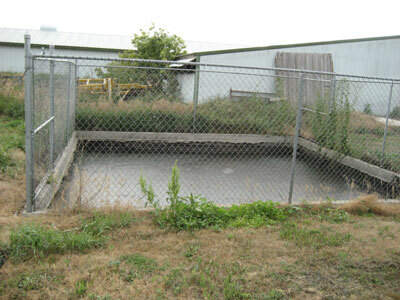 This is what they call the "Honey Pit". There's two of them and they're really big pools filled with pig excrement. 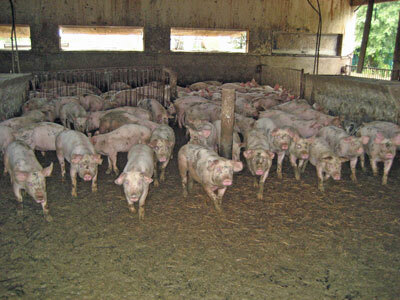 A lot of pigs make a lot of poop. I always imagine what it would be like to climb the fence and dive in for a swim. Then I get sick and go back inside. 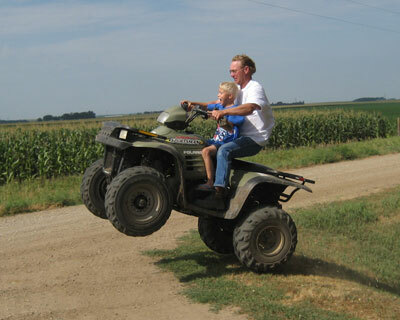 Uncle Jerry dropped by with his 4 Wheeler to give the kids a ride. Now that the boys are getting older, I notice his rides are getting wilder. 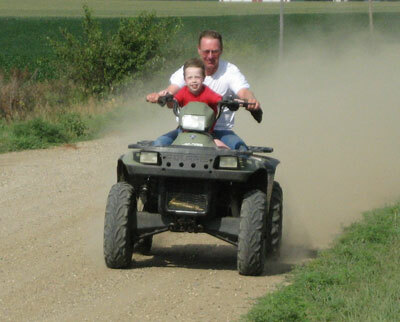 Luke was first and they went flying down the gravel road. I caught this shot on their first pass back in front of the farm. Between passes, I prayed a lot. Cousin Joey bragged to the boys how cool it was to jump the ditches, so of course they each had to have a turn. When I asked Uncle Jerry to go easy with Luke, my son called me a scaredy cat. I told him I've done enough hospital bedside praying for him to last a lifetime. 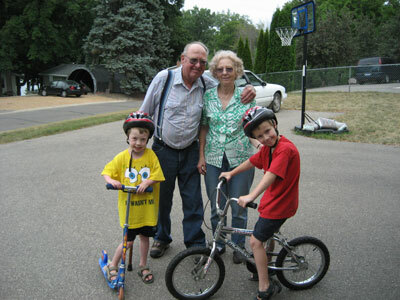 But since Uncle Jerry's a very experienced rider, I bit my tongue and just let them have their fun. 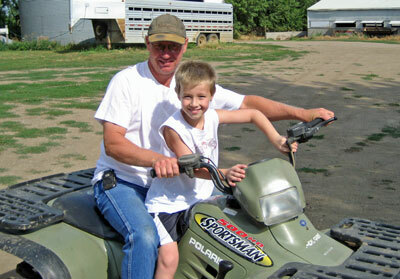 After Jerry left, we went back to doing things that were more my speed like feeding apples to the pigs. 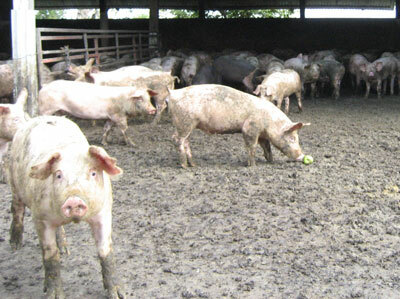 It sure is fun watching pigs battle over dirty apples! 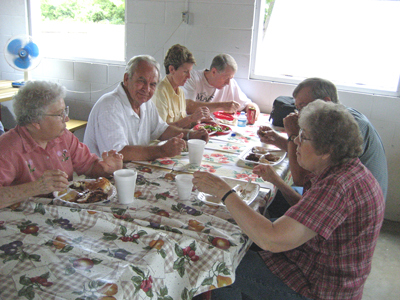 On Saturday afternoon, we attended the annual Timmerman Family Reunion and ate a really good Pot Luck lunch! 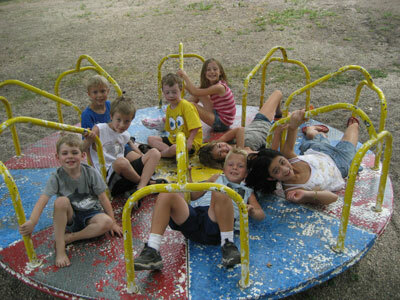 Immediately after the meal, we load all the kids on to the merry go round and spin them as fast as we can. The last one to throw up gets first choice of dessert! 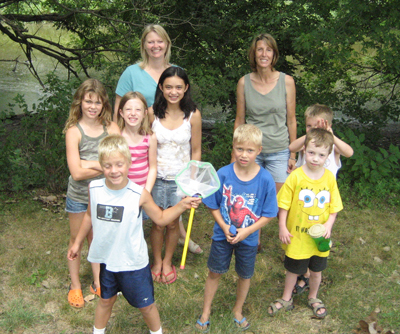 Luke coordinated a frog hunt with his large band of cousins. 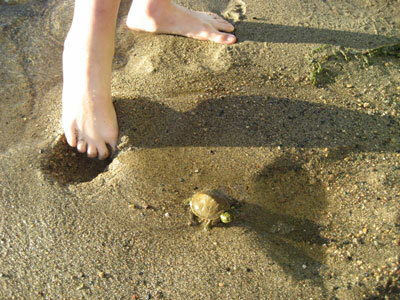 They successfully tracked one down and played with him until we released it back to the river. 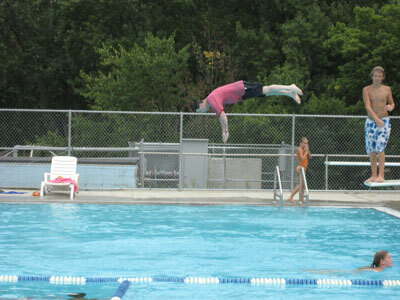 Of course, no Timmerman reunion would be complete without some fancy diving in the Rock Rapids Community Pool. 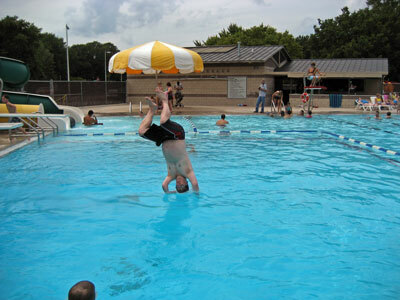 Cousin Todd won the competition when he amazingly was able to suspend himself in mid-air for 10 seconds before finally dropping into the water below. It was quite a sight! 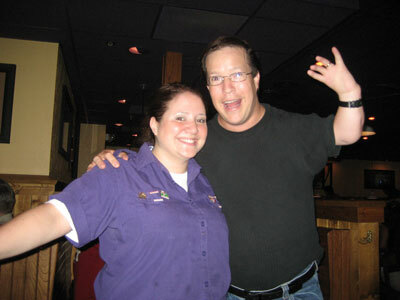 On Friday, we celebrated Shortarmguy's 37th birthday at the Outback Steakhouse in Savage. Miss Sheri's parents joined us for the festivities and were overcome with glee. 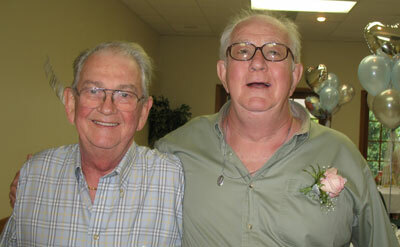 After all, it's not every day that they get to honor their favorite son-in-law for being born. They even helped sing me a little ditty called Happy Birthday To You. 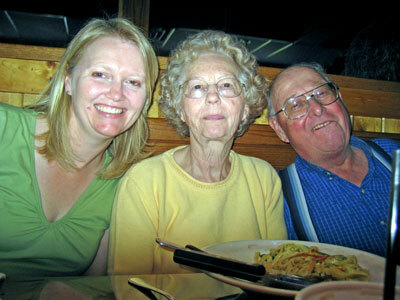 Grandma Linda was a little miffed that all the attention was being placed on me for the occasion. After all, if it weren't for the use of her womb, the event would have never happened in the first place. So she insisted in sharing all the accolades being given to me. 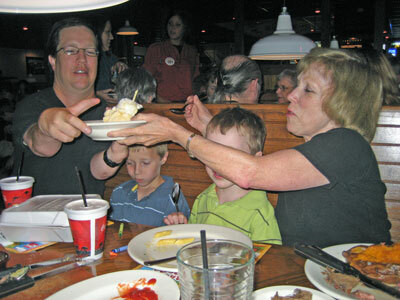 When my birthday sundae was brought to the table, she only let me have a couple of bites before shouting "Pass it around!". She then ate a good portion of my caramel ice cream. Our waitress was a very pleasant lady named Malea. Malea was very prompt at taking our order and quite attentive to our eating needs. However, I was quite disappointed that she wouldn't join for the singing portion of the evening. When I questioned her about it, she was coy and said I wouldn't want to hear her sing. How wrong you were, Malea. How wrong you were. 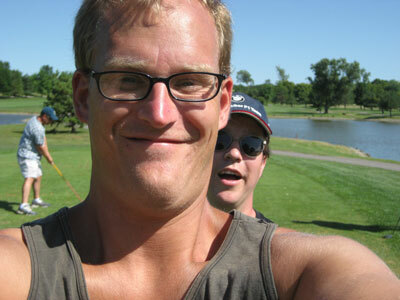 On Saturday, Shortarmguy ventured down to Des Moines, Iowa for Krazy Kory's Bachelor Party. 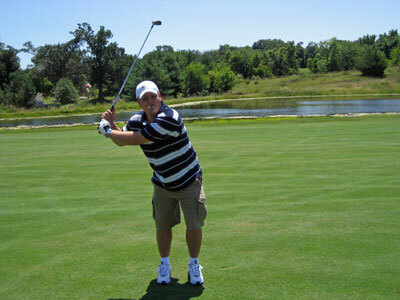 We spent nearly 6 hours golfing at a beautiful course called Beaver Creek. It seemed to be an appropriate name for the occasion. 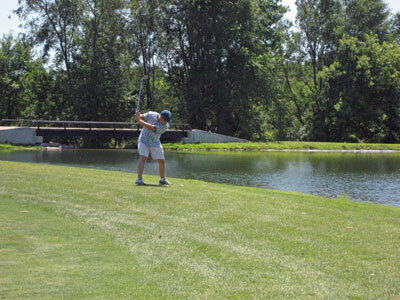 It was quite a challenging course! Jammin' Jason Davis can be seen here trying to swat one over one of the many water hazards we had to endure. I can't quite remember if Jason's shot pictured here ended up in the drink. But if I were to go with the odds, than I'd have to say it did. Joel "Jo Jo" Anderson impressed us early with his play. 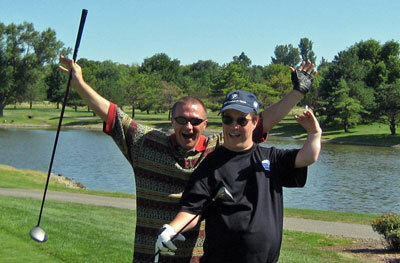 Ron "Sugarman" Myers was very excited to be reunited with all of us and started off the game with a birdie on a tough Par 5 hole. Later in the evening we connected with some other friends for the party. 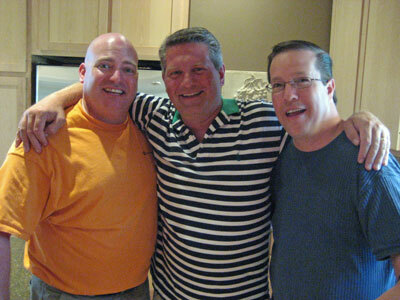 I hadn't seen Mike Glaser in over 10 years, but there he was live and in person! 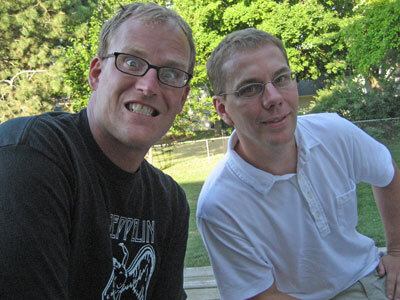 I reminded Mike that I still had some incriminating video footage of him from his 21st birthday party. I told him I thought it would look great on Youtube but sadly he didn't agree. 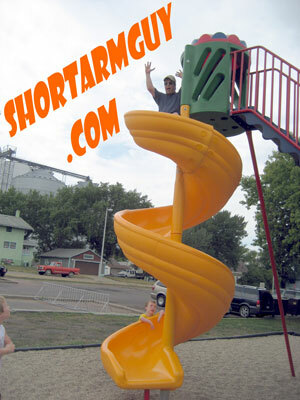 I guess it will just have to remain in the Shortarmguy video vault for at least another 10 years. This is Kory's very colorful friend, Warren. And I mean that in the most literal sense. Warren has 14 tattoos on his body including this full color scene from the Wizard of Oz on his leg. It's quite the work of art! Now I wasn't able to take pictures of the activities that took place during the rest of the evening but let's just say we had a nice, quiet time together. 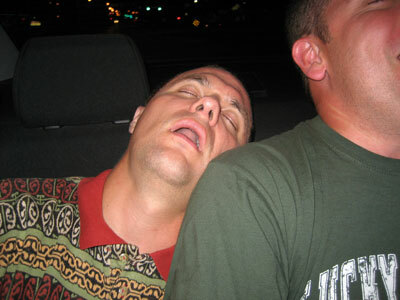 As a matter of fact, it was so mellow that Ron fell asleep before the party was even over! The little tiger was just plum tuckered out after spending so much fun time with his friends. 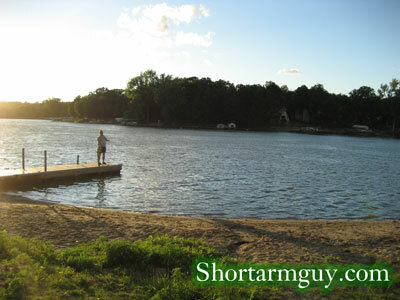 We lost a friend from the Shortarmguy house this week when we let Snappy the Turtle go in Prior Lake. He came home with us from our Missouri vacation after we found him on the beach at Table Rock Lake. Luke had been begging us for a turtle for years and when we found this little guy, we thought we'd give it a chance. After several unsuccessful attempts to feed him, we decided it best to let him go before he starved to death. Now we're going to be eating turtle food for a month! 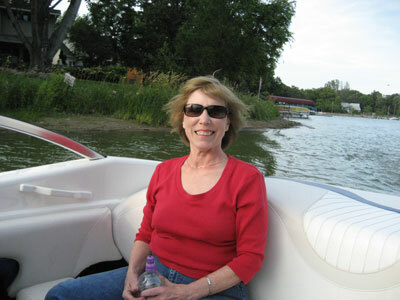 On Friday night, we took Grandma Linda out for a boat ride on Prior Lake. We felt it was about time to start keeping her off the streets at night. I think local law enforcement was happy with our decision. We saw something new on our trip. 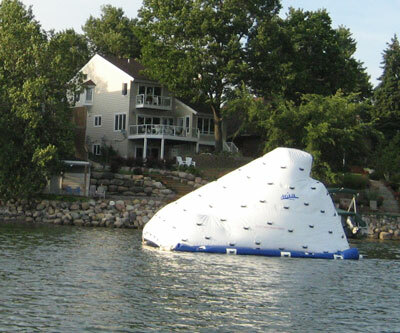 Somebody on the lake has an inflatable iceberg! Now all we need is an inflatable Titanic and the setting will be right for something magical! 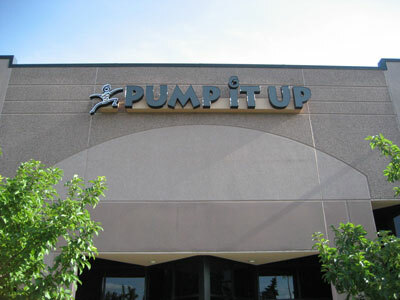 On Saturday, Luke and Avery turned 8 years old and we had their birthday party at Pump It Up in Burnsville. 15 kids. 4 massive inflatables. And a bunch of sugar! Now all we need is something they can use to beat each other with and we're all set! Miss Sheri was getting so stressed out with the wired children that she started loudly challenging each of them to a jousting battle. We finally had to pull her out of there because she was getting so carried away that the kids were being tossed through the safety nets. I think summer vacation home alone with the boys is starting to take it's toll on mom. 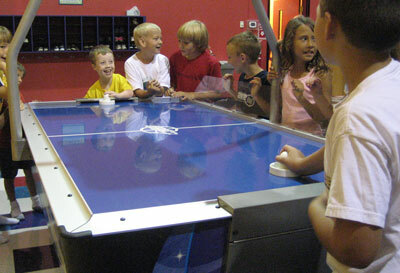 Probably my favorite part of the party was when I saw Luke playing air hockey with one of his friends and a group of kids were acting as spectators. Although I have suspicions his opponent was taking it easy on him, several of the boys began chanting Luke's name and cheering loudly for him to win the game. 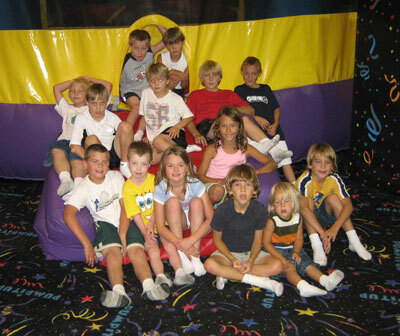 While watching I thought back to a time in Luke's life where an 8th birthday didn't seem possible. Seeing him so excited now while playing with his friends was a pretty happy moment for a proud dad. 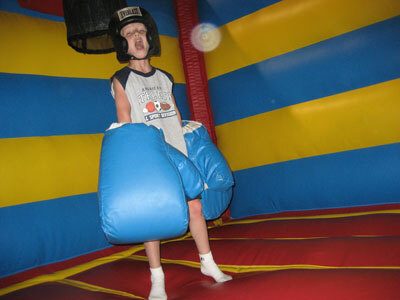 The inflatables didn't treat me very well, though. 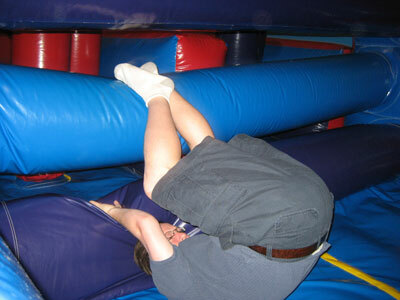 Early on in the event, I challenged a young staff member to a race in the obstacle course. 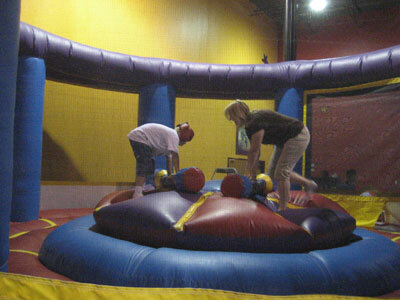 Thinking if I did a somersault through the first wall, it might give me a chance to beat him. Instead it gave me the opportunity to twist my neck in a way I hadn't twisted it in far too long. The pain I'm still feeling today reminds me that I'm a long way from my 8th birthday! On Saturday night, we had the privilege of hooking up with our old friends, Tim Ashland and Dave Wood along with their families. A couple of cocktails were enjoyed along with quite a few laughs. I also managed to sneak a few hair styling tips from Mr. Wood because some day I'm going to wear my head just like he does. 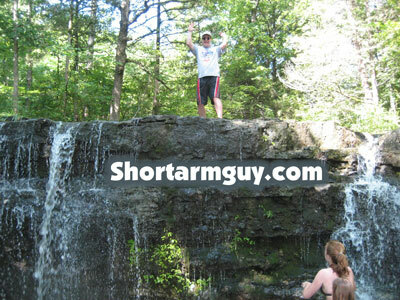 The Shortarmguy family went on vacation this week to Branson, Missouri. As Bart Simpson described it, it's pretty much just like Las Vegas...if it were run by Ned Flanders. 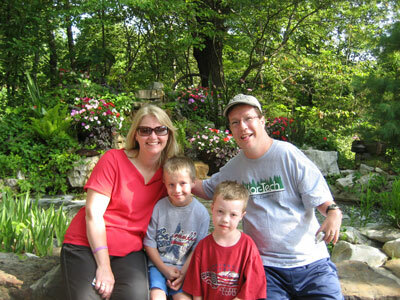 This picture was taken at the front entrance of Silver Dollar City by a guy who worked for the theme park and wanted to charge me $20.00 for the same photo he took with his camera. Silly man. The reason for our visit was because my dad and Joyce now live there. 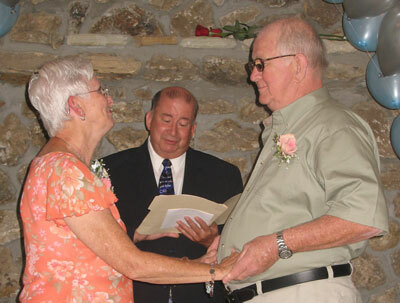 They invited the whole family down for their 25th Wedding Anniversary and included us in a ceremony to renew their vows. It was pretty sweet. 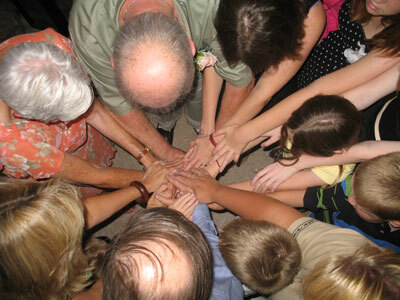 Since they were already married, the minister invited the children and grandchildren up to place our hands on theirs and participate in something he called "Warming the Rings." Not sure if we did it right, though, because I felt them right after we were done and they didn't seem any hotter to me. 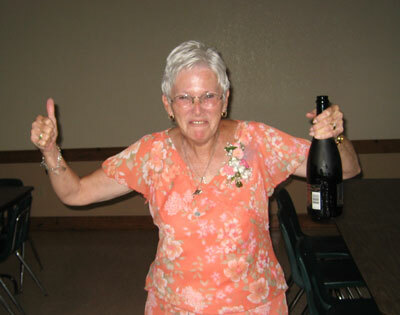 After 25 years with my father including losing her house and all of her possessions in Hurricane Katrina as well as helping him through his harrowing battle with Leukemia, Joyce finally started drinking heavily. Who could blame her. At the end of vacation, our families combined digital photos and discovered that we had taken over 900 pictures in just a few days. It made for a real fun time trying to pull out the best ones for this week's website update! 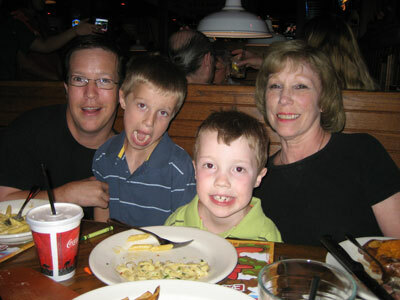 I'm including some family photos to try to include as many people as I can. 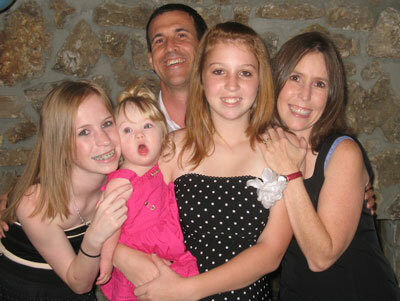 This shot is of my sister, Tracy, her husband, David, and their daughters, Lauren and Britney. 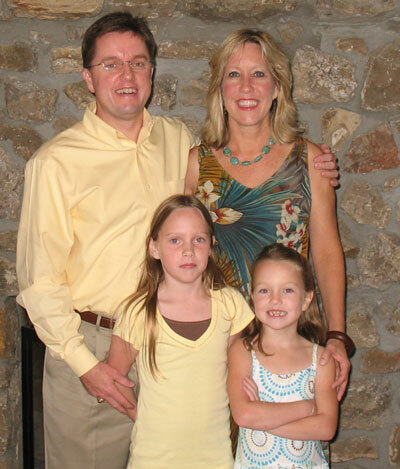 This is my other sister, Tammy, her husband, David, along with Bailey, Mallory, and Lindsay. 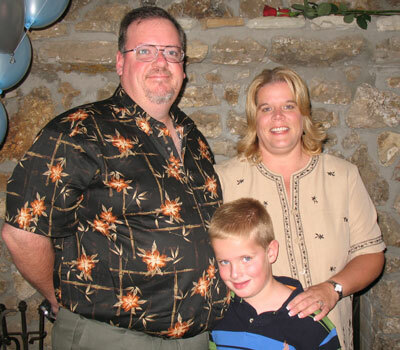 This is my stepsister, Lori, with her husband, Jim, and their boy, Austin. They came all the way from California which I believe gave them the travel distance trophy. This is my dad's brother, David. Normally, we have to get a permit to have so many Swank family members in the same town together but some how we able to get away with it this time. 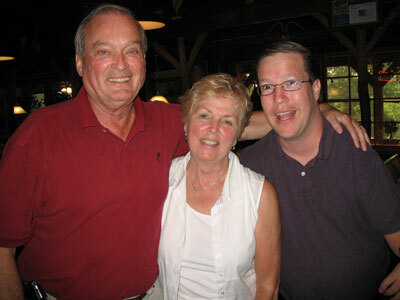 This is Joyce's brother, Tom, and his wife, Bobbi. Tom used to be the Vice President of Automotive for KMART and now owns his own successful consulting business in Michigan. I pretty much stalked him the whole time we were together to try to absorb as much of his knowledge as possible. He seemed a little weirded out when I tried to rub his head, so I resisted the urge to do that. 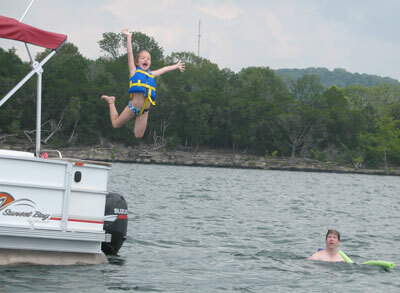 On Monday, dad rented a couple of boats so we could explore Table Rock Lake. 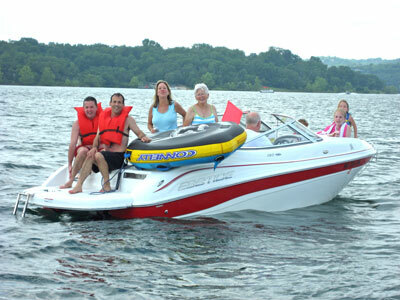 Right before the trip, my brother in law, David, and my other brother in law, David, announced that they went shopping for life jackets together and wanted to sit side by side the whole time we were on the boats. It was just a little bit disturbing. An amazing thing happened when suddenly Britney started flying around the boats like Peter Pan. She did about three revolutions close to the water and then shot off like a rocket into the sky. We didn't see her again until the next morning. I tried to ask my sister for an explanation, but she just shrugged it off and said "It happens sometimes." 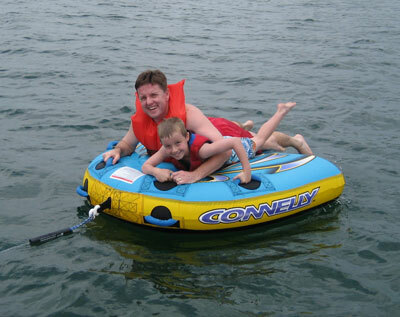 Avery was able to drag my brother in law, David, away from my other brother in law, David, just long enough to be pulled around the lake on this tube for awhile. I tried to wipe them out, but their arms were just too strong. Luke refused to go on the tube. 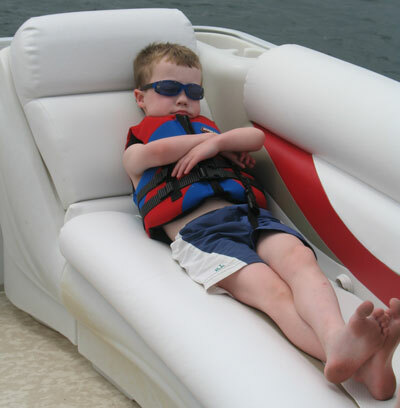 Instead he laid on the boat most of the day occasionally shouting "More Wine!" We tried to explain to him that it was juice he was drinking, but he'd just brush us away with his hand. 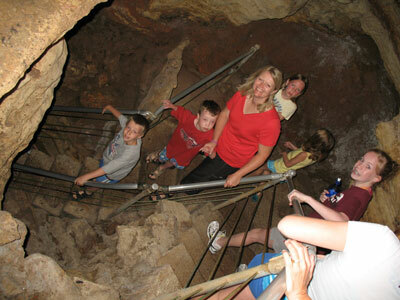 On Tuesday, we visited Silver Dollar City and explored Marvel Cave. We had to navigate more than 600 stairs to get to the bottom of the tour area then we pretty much just climbed out again. Very exciting. 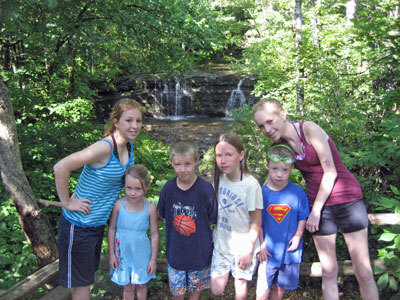 On Wednesday, we took the kids for a hike to see a lovely stream and waterfall. I couldn't believe how clear the water was! As a special treat, we had a contest to see who could catch the greatest number of ticks in their hair before we got back to the hotel. 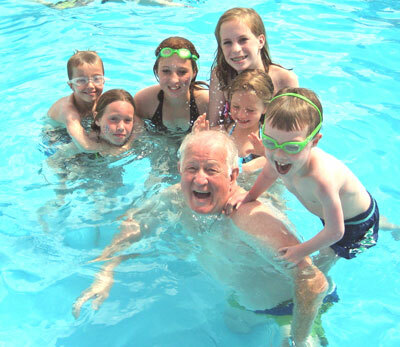 I think Grandpa Bob had a pretty good time having a bunch of his grandkids together. Until they joined forces and started holding his head under water for long stretches of time. We finished out the trip with a little fishing expedition. 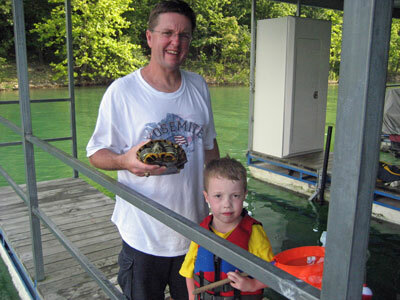 We didn't catch a whole bunch beyond this turtle and a striped leech attached to the bottom of his shell. But all in all, we had a pretty dang good time!